By Srinivas Chowdary Sunkara // petrobazaar // 1st Dec, 2018. 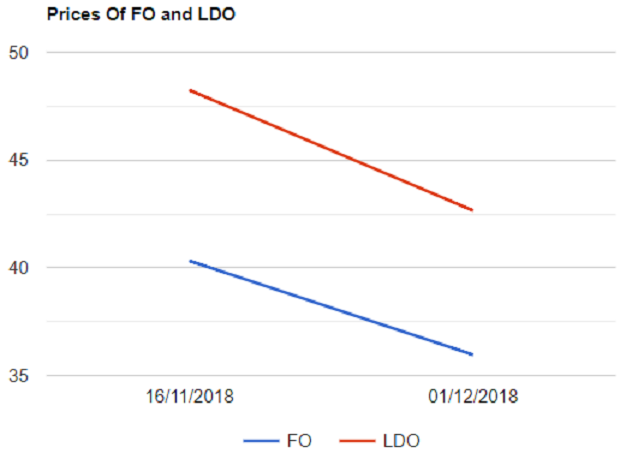 As we estimated, Furnace oil (FO) and Light Diesel Oil (LDO) prices are dropped significantly for the first fort night of Dec across the Indian market. All the national oil marketing companies in India slashed both the industrial fuels prices by around 10 -11 pct across all the depos in India. On the 1st of Dec, 2018, The product markets are in nose dive in line with slump in global crude markets and bunkering markets along with the recovery in local currency against $. As per the publications of oil marketing companies, At Visakha depo, Furnace oil prices are dipped by Rs.4370/KL to Rs.35360/KL and LDO prices are cut down by Rs.5600/KL to Rs.42650/KL. In the Singapore market, IFO 180 cSt and 380 cSt graded fuel oil prices shrank by $56 or 11.23 pct where as the rupee pared earlier losses by 1.37 pct. The global crude markets lost 22 pct since the beginning of the month.